Frank Munoz is a PhD student in the School of Mind-Body Medicine at Saybrook University. Frank has worked for the last 12 years as a clinical chaplain in a hospital setting with a clinical specialty is palliative care chaplaincy. He also has a background in Army and Air Force chaplaincy. In 2010 Frank received a grant from the National Institute of Health and National Cancer Institute to train as a healthcare researcher. The grant provided funds to pay for a doctorate degree as part of research training, which inspired him to choose enrollment in Saybrook University’s School of Mind-Body Medicine. Frank was drawn to the Mind-Body Medicine PhD program due to its innovative and creative spirit. Modifying gene expression: Current research shows that the human genome defines a range of possibilities, including illnesses such as cancer or autism. Many factors, from nutrition to stress to lifestyle, can determine whether and how much these genetic possibilities get expressed in a particular individual. Frank’s research focuses on measuring how much spiritual care and mind-body techniques can positively modify gene expression. 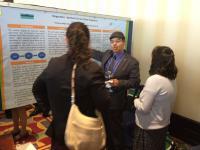 Frank’s research has resulted in two poster presentations and one published abstract. The Association of Professional Chaplains (APC) accepted Frank’s poster on “Spiritual Care and Gene Expression.” At APC Frank intends to share what he has learned thus far in his doctoral journey on the measurable effects of spiritual care on gene expression. He is scheduled to present this poster at APC’s next national conference in June 2015. Additionally, the American Society of Clinical Oncology (ASCO) has accepted an abstract on Frank’s research for publication. In a pilot study, Frank measured the effects of the Mind-Body Medicine Epigenetic technique (MET) on p53 gene expression. The expression of the p53 gene is important in the control of cancer growth. ASCO has published Frank’s abstract on their website. Frank intends to continue his studies on the potential of mind-body modalities to modulate gene expression.